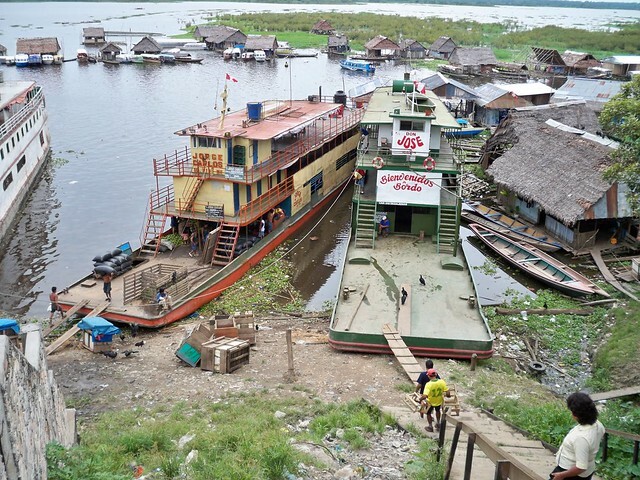 Tom Filipowicz leaves dusty Chiclayo for the steamy Amazon city of Iquitos – a place of childhood fantasy. Tom graciously takes us with him on his tour of the city. Back in the forties and early fifties the movie houses always showed ‘news shorts’ before the main feature. Frequently there were 30 second clips on the ‘Amazon Jungle and the mighty Amazon River.’ The jungle had lots of monkeys and huge snakes and other dangerous things, but even worse were the Jivaro head hunters. These guys were fierce. I mean, before you could say “Hello, my name is…” Whap! – your head would be in a pickling pot with your lips sewed shut. We kids (and quite a few adults) used to fantasize about the Amazon and vowed that when we grew up we’d go there. It took more time than expected, but I finally made it. 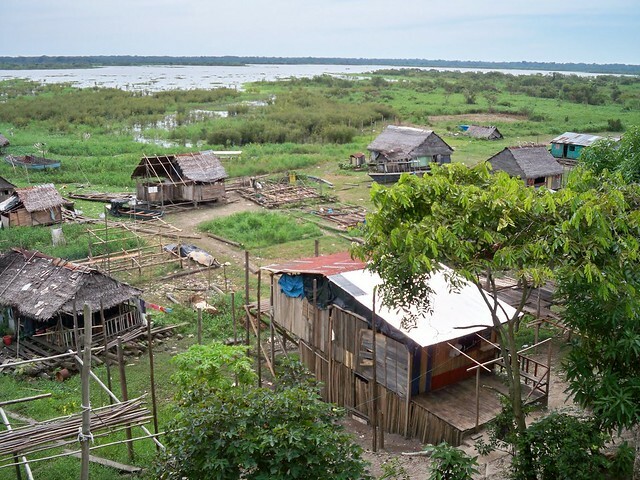 Iquitos is a city on the Amazon accessible only by air or boat. It is the place I would recommend to anyone who could visit Peru only once in their lifetime, because Iquitos is a composite of almost everything Peru has to offer. 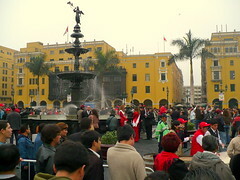 The city itself has three ‘faces.’ The inner city is not much different from any of Peru’s major cities or larger towns. Anyone from Chiclayo, Arequipa, Cajamarca or even Lima would feel a familiarity walking the streets. A second facet of the city is the river shore inhabitants. This would include Belen to the south and the fringe area bordering the city’s east side, as can be seen while walking the malecònes Tarapaca and Maldonado. 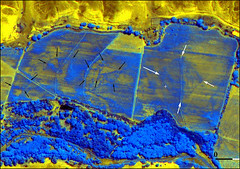 A third distinct segment is what appeared to me to be new communities being carved out of the jungle on the city’s south side. 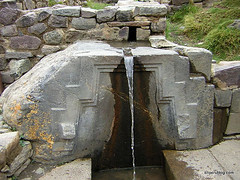 I say “appears to be new” because in Peru what looks new may be ancient or vice versa, probably because the architecture and building materials don’t change. 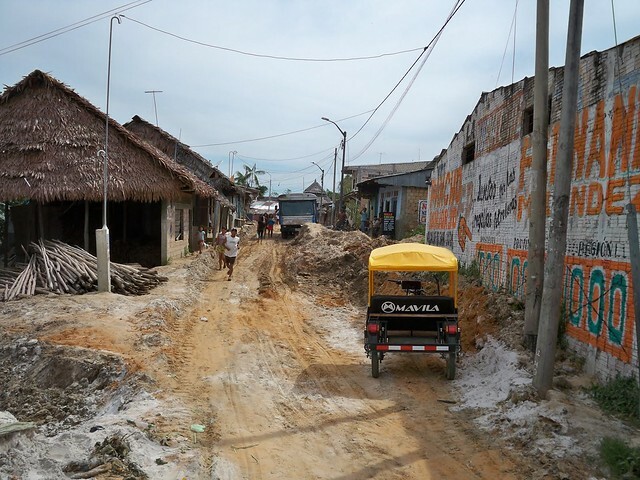 Houses in this section are being built with untreated lumber and thatched roofs as they have been for centuries. 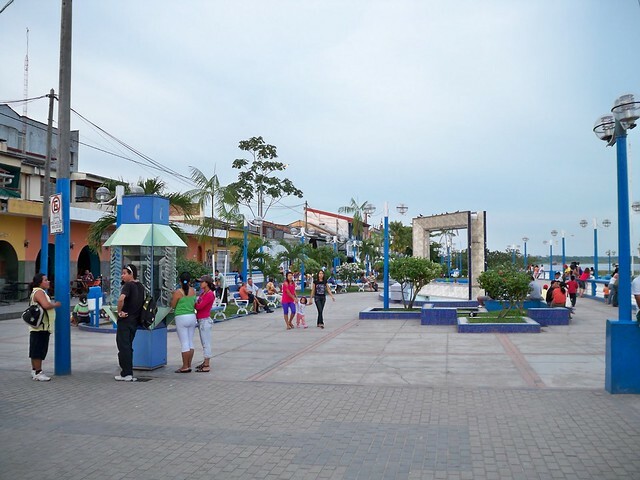 Several characteristics stamp Iquitos with a distinct personality. First would have to be the comparative scarcity of taxis and other private autos. In their place are thousands of moto taxis and motorcycles. Only in the jungle or outskirts of the city can you escape the sound and smell of these metal beasts. The heat and humidity were to be expected but still, the first step off the plane at the airport was like being confronted by a hostile living force. Another difference is the speech pattern of the Iquiteños, which is sing-song and melodious compared to coastal city dwellers. 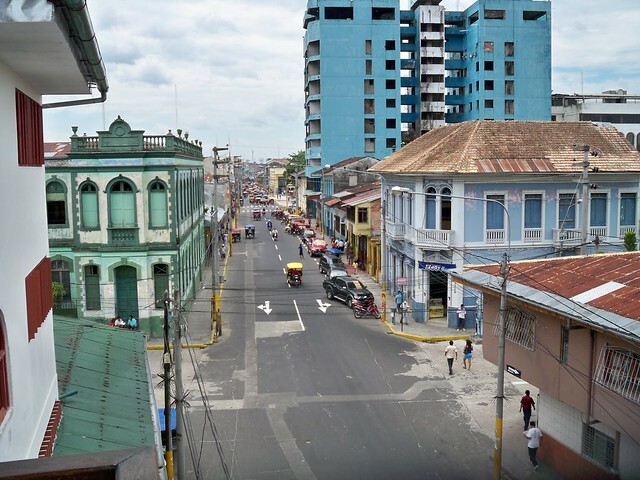 And speaking of the residents, I would bet that as a percent of the total population, Iquitos has the largest gringo population of any city in Peru. There is almost never a time when several are not in view. Some are tourists, but the majority we saw were unquestionably residents, with many of them projecting an image of having ‘gone to seed’ over time. 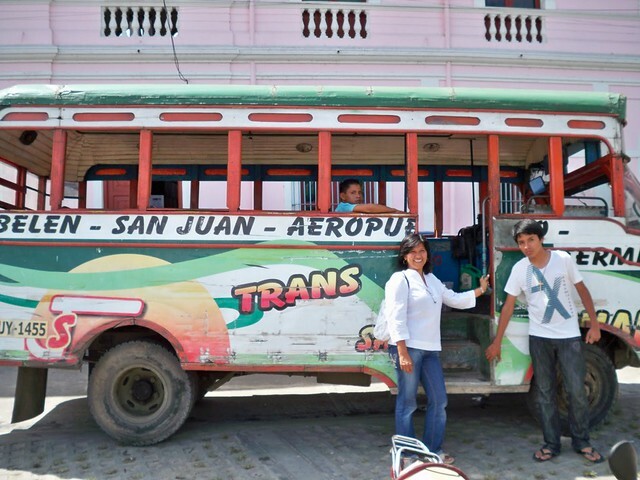 Whatever it is in Peru that brings out that ‘free spirit’ look, Iquitos has more than its share. 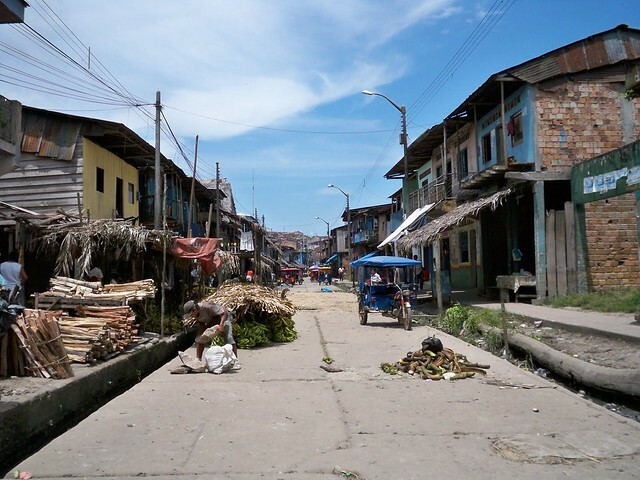 There is even an English language newspaper – the Iquitos Times. 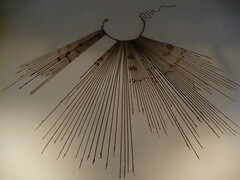 There is more to do and see in and about Iquitos than I expected. We managed to see everything we wanted to in five days, but just barely. A trip to the excellent tourist office will provide the visitor with maps and most of the standard tourist options. 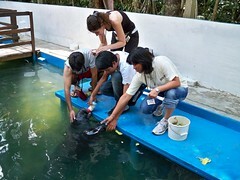 Among the standard attractions we saw were the Manatee Rescue facility, sponsored by the Dallas World Aquarium, and that same day the nearby Quistococha zoo/lagoon/park complex. Both were worth the time. One of the attractions I reluctantly agreed to was a boat ride up the Momòn River to visit the Yahùas tribe. I was reluctant because I expected to see a theatrical production followed by various approaches to extract the last penny from my pocket…which for me is exactly what it turned out to be. Enough said about that. Subsequent days found us at the Amazon Sculpture museum in the city, and the ‘Serpentario’ located on the Nanay River, also enjoyable experiences. The Belen market is worth seeing, but it is not a pleasant area in terms of sight and smell. Most people we talked with told us to avoid the area after 5:00pm because of pickpockets. The activities we enjoyed most were ones we created ourselves. Boarding a colectivo at one of the terminals and riding it to its destination terminal is a good, inexpensive way to see the city. It’s also a cooling experience during the heat of the day as colectivo windows have no glass. If you’re willing you can walk a long way along the river front in either direction from the Boulevard. Each step reveals a different perspective of the river shore inhabitants and their daily lives/activities. It was interesting to watch the river boats being unloaded at the Produce Market. It was mostly bananas and charcoal we saw being unloaded. 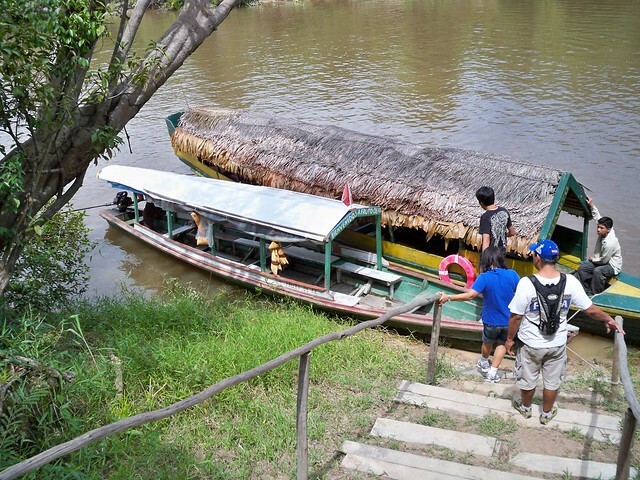 One of our favorite activities was to ride a moto taxi to the port of Nanay, and there to charter a peque-peque to take us to various destinations we selected on the Nanay and Momòn Rivers. We were told they don’t go on the Amazon as the current is too much for a peque-peque to handle. You don’t need a guide. Simply point to the place on a map that you would like to go and then negotiate the price with the captain. 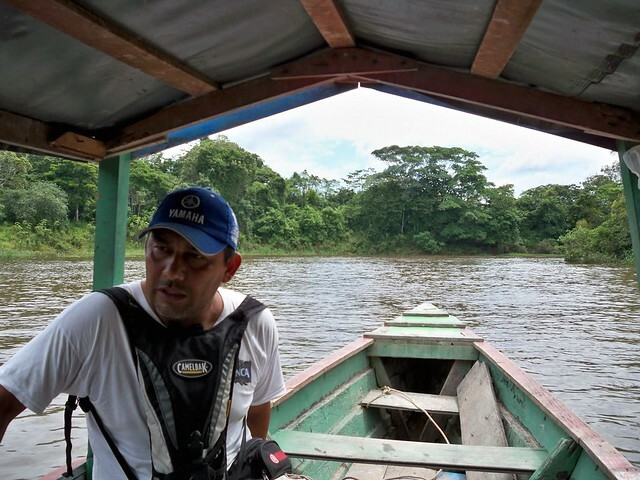 Though there is lots of boat traffic on the rivers, riding on the Momón River instills the feeling of a wild river and jungle environment without having to travel for many miles at significant expense. Incidentally, during our five days in the city, on the river and in the jungle we never saw a mosquito. 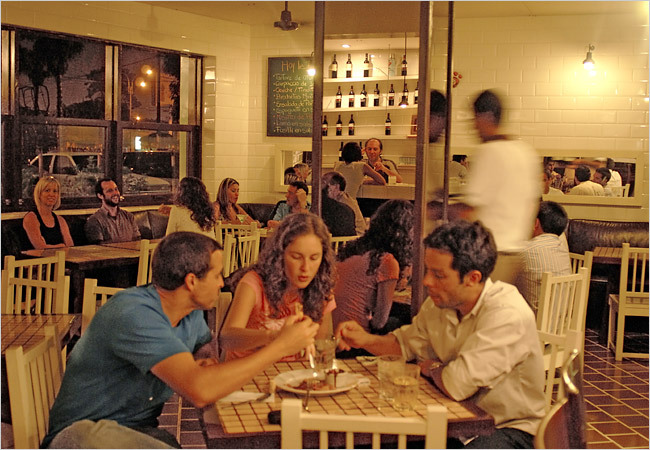 Walking the boulevard; stopping for a meal or cool drink (camu-camu became our favorite) and people watching is a relaxing pastime, especially toward sundown when the place comes alive. It reminded us a bit of the bohemia feel of Lima’s Kennedy Park and of Mancora. I can understand why people would be attracted to Iquitos. It’s got something for most everyone plus there’s the attraction of the wild jungle just around the next bend in the river. The Jivaro head hunters are gone, but hey!…you can’t have everything!